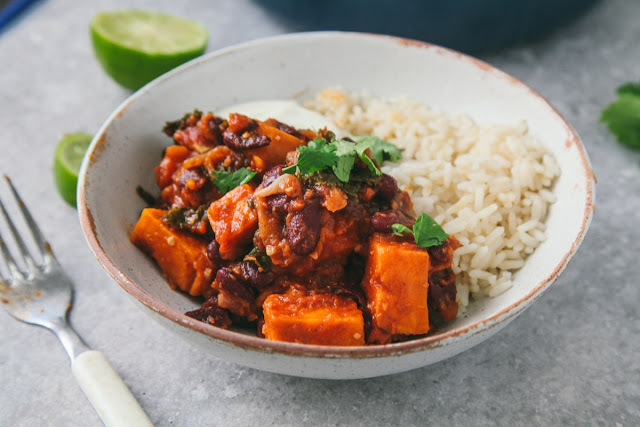 A winter warming vegetarian chilli, packed with delicious flavours and healthy ingredients! I’m in the process of re-visiting some old recipes and giving them a re-vamp with some new photos and video instructions so you might see some familiar recipes resurfacing every now and then! This recipe I first posted three years ago and is still one of my staple favourites. It’s just SO easy to make and packs in so much flavour and nutrition. Heat the olive oil in a large saucepan and add the sweet potatoes, onion and garlic. Cook on a medium heat for 5 minutes until the veg has softened slightly. Stir in the chili, cayenne pepper, cinnamon and cumin and cook for a futher couple of minutes. Add the kidney beans and chopped tomatoes, stir to coat the vegetables thoroughly then simmer gently for 30-35 minutes. Add a little water if it becomes too thick. At the last minute, add the kale. Don't over cook it, just let it wilt slightly so it retains colour and texture. 0 Response to "SWEET POTATO & KALE CHILLI"